Years ago a well-wisher based in France send me a CD of scanned artwork by a French Orientalist painter, called Paul Élie Dubois (1886-1949). 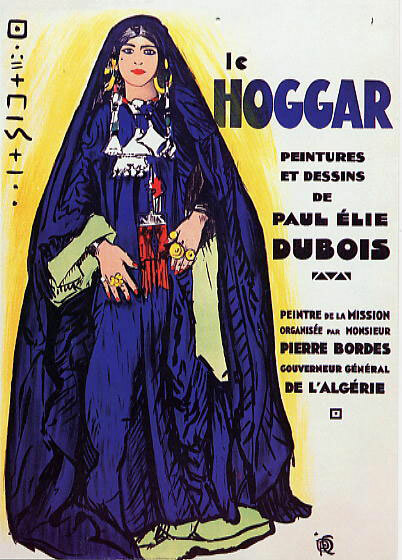 In the 1920s and 30s Dubois travelled frequently in the recently colonised Hoggar of southern Algeria and went on to exhibit his work as well as illustrate limited editions of popular books on the area, such as Chants du Hoggar, a series of courtly Tuareg legends and fables retold to the author, Angèle Maraval-Berthoin. A figure in one of the legends over whom Tuareg ‘knights’ fight is known as Dassine, also the name of the long established campsite on the east side of Tam. Now I know. Images from that book appear below, followed by a few general views of southern Algeria also by Dubois and which some may recognise. This entry was posted in Desert Babbles (blog) and tagged Angèle Maraval-Berthoin, Camping Dassine, Chants du Hoggar, Paul Élie Dubois, sahara water colours on January 27, 2013 by Chris S.